Recorded in New York, October 1950 – June 1953 and Hollywood (Tracks 17-20) February 1952 – June 1953. I approached this CD knowing only one or two songs – She Wears Red Feathers and Pittsburgh, Pennsylvania. And of course there are a number of these catchy songs on this fine selection. But what surprised me most of all were some of the big ballads that make up a fair proportion of this CD. 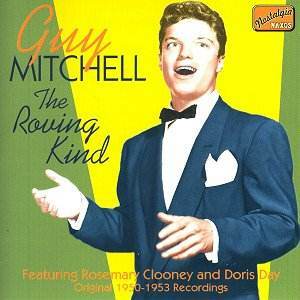 I always imagined that all of Guy Mitchell’s songs were what might be called ‘novelty’ songs. But I soon found that his art encompasses a variety of styles. For example the tune A Beggar in Love matches anything from the ‘old groaner’ himself. Now I must confess that my usual kind of music is classical and when I drift into the more popular world it would be music from my era, such as the Beatles, Yes or Led Zeppelin. Yet, having spent many hours listening to the Light Programme with my bedridden grandmother in the 1960’s I must have heard a lot of music in the ‘air’ as it were. So when I through-played this CD everything seemed kinda’ familiar. It was a little bit like meeting old friends. Guy Mitchell was born with the unmarketable name of Al Cernick – and became a child star at the age of 11. It was not until he recorded two songs for Mitch Miller that he became an overnight success. Both of these songs are recorded here –My Heart cries for You and The Roving Kind. He had a string of hits with My Truly, Truly Fair, Sparrow in the Tree Top, Feet Up (Pat him on the Po-Po) and Belle, Belle, My Liberty Belle. It has been well said that the original Mitchell sound was part of the last fling of the American age of innocence. In some ways he was the first of the teen-idols that would later include Fabian and Frankie Avalon. However, soon the rock n’ rollers would be ‘ripping it up.’ The big names would be Bill Haley, Jerry Lee Lewis and of course Elvis. Mitchell’s career never really recovered from this sea-change in popular music. However he did earn a living in television, films and the nostalgia circuits until his death in 1997. Always popular in the United Kingdom, he is reputed to have received a standing ovation in the Barbican Hall when he appeared there in 1984. So the beauty of this CD is that it gives most of his big hits in the era when he was at his peak. The later country and western hits and his belated attempts at rock and roll are wisely sidestepped. This is a superb production. The sound quality, which has been restored, is excellent. It is hard to imagine that these tracks were ‘laid down’ more than half a century ago. The CD could have been a bit longer than the 57 minutes – surely there were a few more tracks that could have been included. On the positive side it is commendable that they have included songs with other singers. It is good to hear Rosemary Clooney, Doris Day and Mindy Carson. I was chatting to friend the other day and I mentioned reviewing this CD. After a little thought she asked me if Guy Mitchell had sung a song called My Truly, Truly Fair. I told her that he had. Apparently back in the early fifties her father had sang this little song to her on bath night! So happy memories all round of an age of innocence that has been largely lost this past half century. When push comes to shove I think this is nostalgia at its best. Most of the songs are good examples of the sentimental or novelty genre. And, finally, at the end of the day any singer that can sing ‘I took her for some fish and chips’ convincingly gets my vote any day.